Rising Impactors—a joint initiative of AUBG and the Bulgarian business— will provide full-tuition scholarships to young and socially engaged Bulgarians. Representatives of AUBG, the business, and the media gathered together Feb. 7 at Peroto Literary Club in Sofia to celebrate the launching of the program. The scholarship program, open to all twelfth-grade students in Bulgaria, will support future AUBGers who have brought positive change to the community they live in. 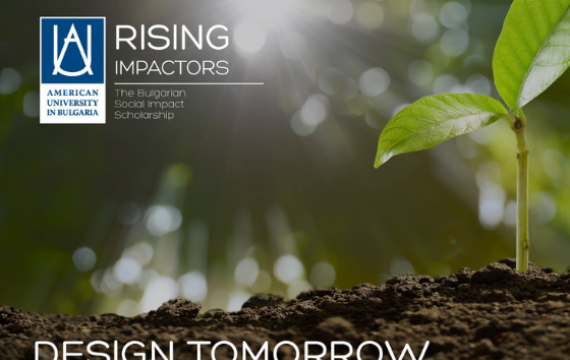 A committee will choose the first Rising Impactors scholars following a thorough selection process that looks at the projects’ impact and sustainability. The person to first come up with the idea for the scholarship— a scholarship that has since been embraced by accomplished professionals coming from all paths of life—was Tom Higgins, member of the Board of Trustees at AUBG. Alexander Dourchev (EMBA ’10), AUBG Professor and CEO of All Channels Communication Group, is also among the pioneers in supporting the scholarship initiative. 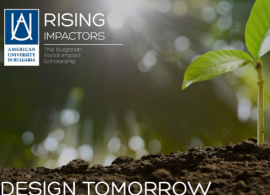 The very first person to contribute to the Rising Impactors program is Rosen Plevneliev, President of Bulgaria (2012-2017) and AUBG Special Envoy. An ardent supporter of social initiatives, he has donated 10,000 BGN to the scholarship and has made a commitment to donate 10,000 BGN more next year.